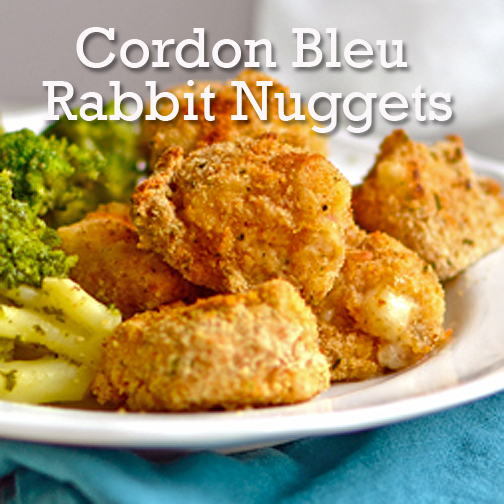 These Cordon Bleu Rabbit Nuggets are easy to make and will quickly become a favorite recipe! Slice the rabbit into about 24 chunks. Slice each chunk in half, hamburger style. Slice the ham and cheese into squares the same size as the chunks. Sandwich a piece of ham and a piece of cheese between each pair of rabbit chunks and secure with a toothpick. In one bowl mix together the flour, salt and pepper. In another, beat the egg and water. Place the bread crumbs in the third bowl. Dunk each chunk into the flour mixture, then the egg mixture, and then the breadcrumbs, then place on a greased baking sheet. You can leave the toothpicks in for now. Lightly spray all the nuggets with some cooking spay and bake for ten minutes. Then remove the toothpicks, flip the nuggets, and cook for ten minutes more.